WW2 - The Second World War: "Is Paris Burning?" The book and the film "Is Paris Burning?" "Is Paris Burning?" by Larry Collins and Dominique Lapierre deals with the final days of the German Occupation in the summer of 1944 leading up to its liberation on Friday 25 August 1944. The title of the book by Larry Collins and Dominique Lapierre comes from the question that Adolf Hitler is reported to have asked when told that the German occupation of the city had ended. The all-star cast that appeared in the subsequent film version of "Is Paris Burning?" almost reads like a "Who's Who?" of the time. Among the cast are Kirk Douglas, Glenn Ford, Gert Fröbe, Orson Welles, Anthony Perkins, Robert Stack, Charles Boyer, Yves Montand, Leslie Caron, Jean-Paul Belmondo, Simone Signoret and Alain Delon. Many of the scenes were shot at the actual locations where the wartime events took place. René Clément (1913 - 1996) directed the film version of "Is Paris Burning?" One of his previous film credits also dealt with the French Resistance of World War Two: "La Bataille du rail" ("The Battle of the rails") released in 1946. Maurice Jarre's theme tune in the soundtrack of the film, "The Paris Waltz", was nominated for a Golden Globe Award for the Best Original Score for a film. The reasons why Paris still retains many of its historic buildings and structures were largely due to events that happened in July and August 1944, as covered in both the book and film "Is Paris Burning?" Photographs No. 2 and No. 3 (above) are modern views of Paris. The city of the 21st Century would most likely have looked much different had the city suffered the widespread destruction that Adolf Hitler had intended. 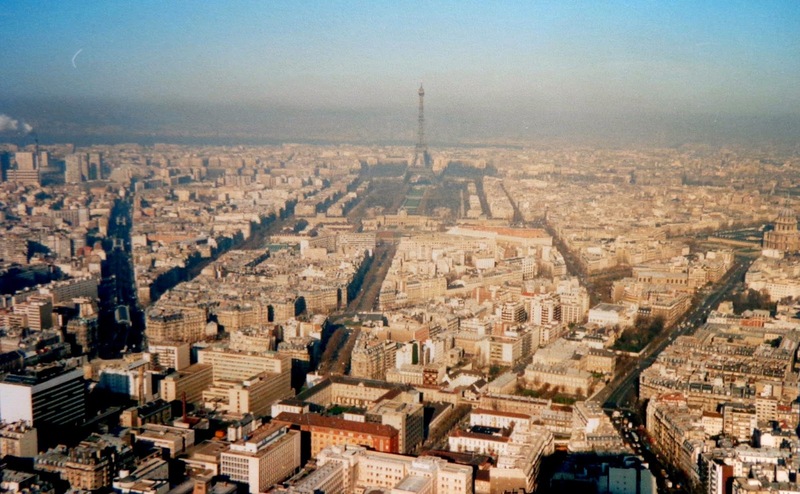 For example looking towards the north-west through the window from the Panoramic floor of the Tour de Montparnasse, among the landmarks that can be seen are the Eiffel Tower, the École Militaire, the Champs de Mars, the Trocadero Gardens and the Palais de Chaillot [as seen in Photograph No. 2]. These were among the landmarks planned for destruction by Adolf Hitler. Photograph No. 3 shows the view from the Eiffel Tower, also looking towards the north-west, with the Trocadero Gardens, the Palais de Chaillot and the Passy Cemetery in the foreground. This was not a view that Adolf Hitler managed to see during his visit to Paris in June 1940 as the lift (elevator) had been sabotaged and put out of action! Had the Eiffel Tower been destroyed in August 1944 then for ever afterwards nobody else would have enjoyed this view either. The history of the city of Paris on Saturday, 26 August 1944 did not therefore deal with its destruction nor was it written by Adolf Hitler. 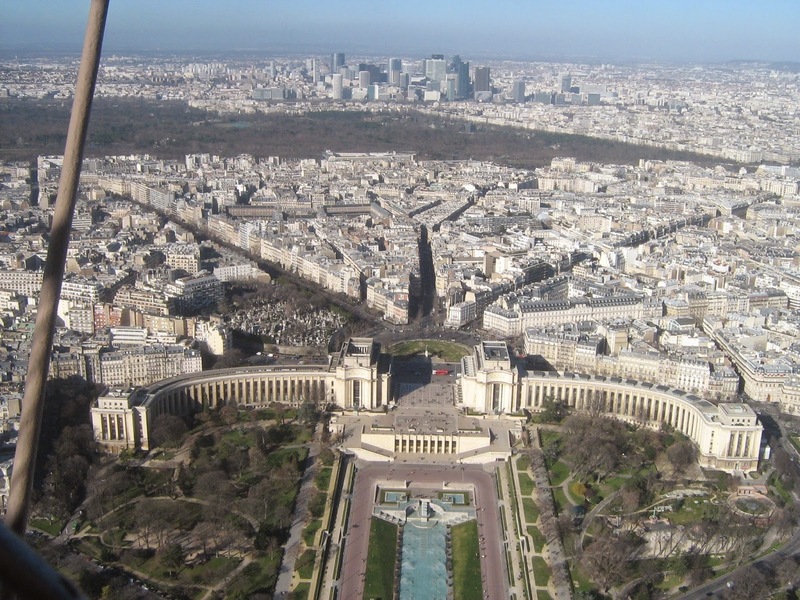 Rather, the history of the city on that day is about its deilverance and the central figure in the story was the leader of the Free French, General Charles de Gaulle. For a little over four years Charles de Gaulle had placed his belief in the Almighty, in France, in himself and in his own personal destiny. This was the day when all these things would be seen by the French people and the whole world. On the day after its deliverance, General Charles de Gaulle rekindled the Eternal Flame at tomb of the Unknown Soldier underneath the Arc de Triomphe before walking down the Champs-Elysee to hear the "Te Deum" at the cathedral of Notre Dame de Paris. Photograph No. 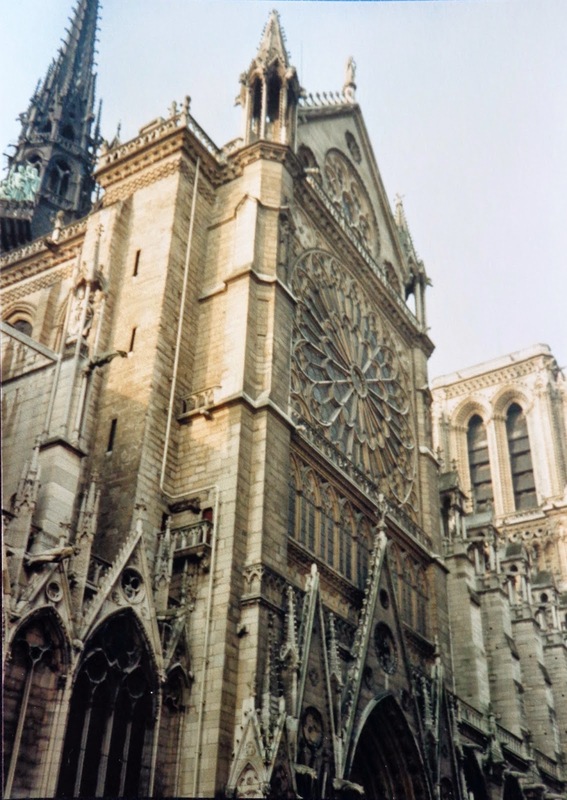 4 shows some of the intricate Gothic masonry of Notre Dame cathedral. If Adolf Hitler had had his wish this was one of the buildings in Paris that would already have been reduced to rubble. "Tall and poised, towering above the crowd around him, Charles de Gaulle stood at the Arc de Triomphe before the tomb of France's Unknown Soldier. He laid a wreath of red gladiolas on the simple stone slab above the tomb. Then, with a sybolic gesture, de Gaulle relit the grave's Eternal Flame, the first Frenchman to perform that halllowed act in freedom since June, 1940. After a moment of silence, de Gaulle turned and inspected the tanks and armoured cars of the 2nd Armoured lined up around the Étoile. From balconies, roftops, windows and curbs, thousands cheered him. Then he returned to the base of the Arch. Before him was the Champs-Élysées. All the way to the Obelisk, its borders were black with cheering crowds. Overhead, a warm sun shone out of another cloudless sky, brightening a rainbow of summer dresses, flags and banners. Rarely in history had it been given to a man to live a moment of triumph as dizzying and exalting as that now awaited Charles de Gaulle. A surprise enemy air attack could, he knew, end this glorious moment in bloodshed and tragedy, a tragedy for which his foes would be quick to blame him. But, at this moment, looking at that mass before him, de Gaulle "believed in the fortune of France" - and in Charles de Gaulle". 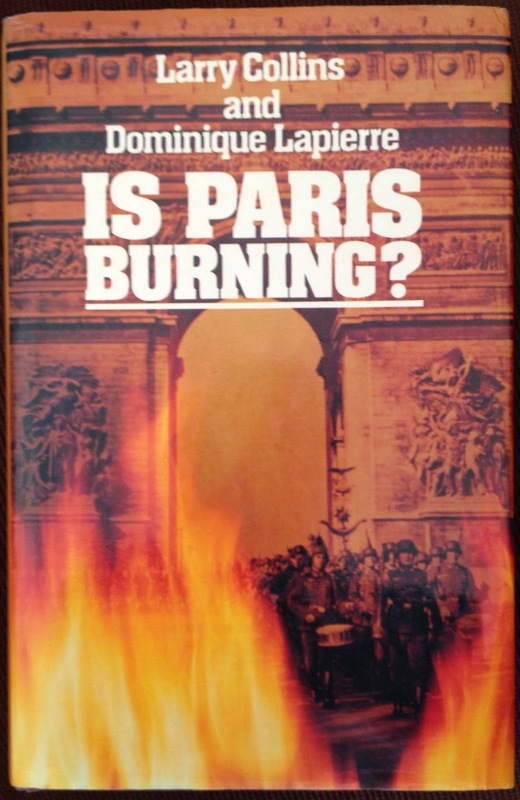 ["Is Paris Burning? ", Larry Collins and Dominique Lapierre (1965), Part Three, 'Deliverance', Chapter 17, pp. 333 - 334]. On Saturday 26 August 1944 Paris was not burning, nor would it burn. This was the greatest day in the life of Charles de Gaulle. It was also one of the greatest days in the long history of the city of Paris. The 1966 recording of the song "Paris en colère" ("Paris is angry" in English) by Mireille Mathieu used the lyrics of Maurice Vidalin and Maurice Jarre's soundtrack ("The Paris Waltz") from the 1965 film "Is Paris Burning?" This film, with an international cast is based on the book by Larry Collins and Dominique Lapierre, the front cover of the English language version can be seen above. The lyrics of the song "Paris en colère" refer to the determination of the French Resistance in the city during the last days of the Occupation. Paris, the French capital, is personified in a rebellious, impetuous yet courageous mood that provides inspiration to a previously downtrodden people.